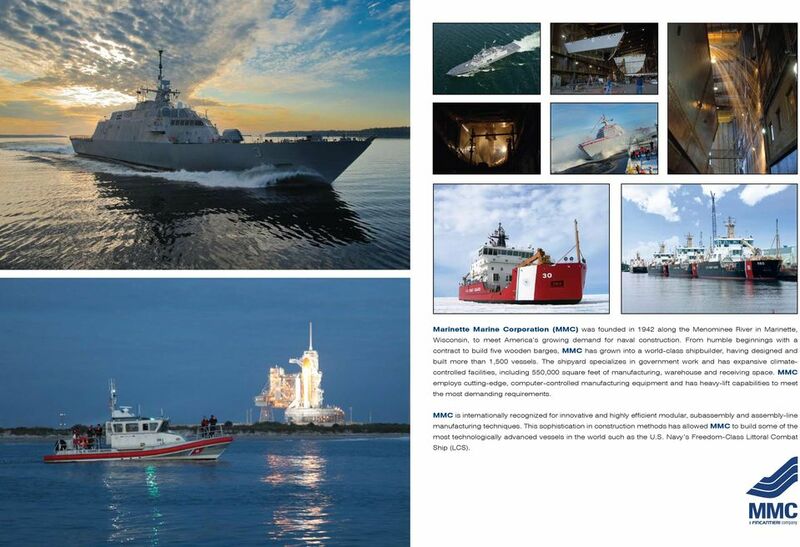 2 Marinette Marine Corporation Bay Shipbuilding Company Ace Marine Complete Marine Solutions. Complete Marine Solutions. Complete Marine Solutions. Complete Marine Solutions. 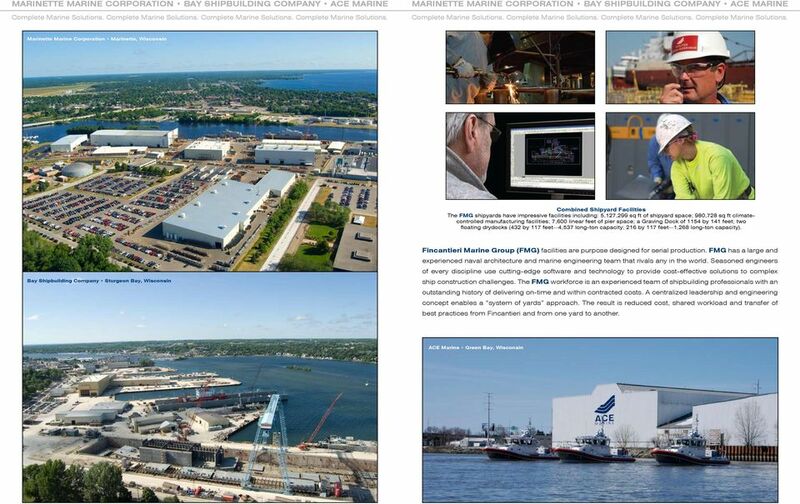 Marinette Marine Corporation Bay Shipbuilding Company Ace Marine Complete Marine Solutions. Complete Marine Solutions. Complete Marine Solutions. Complete Marine Solutions. 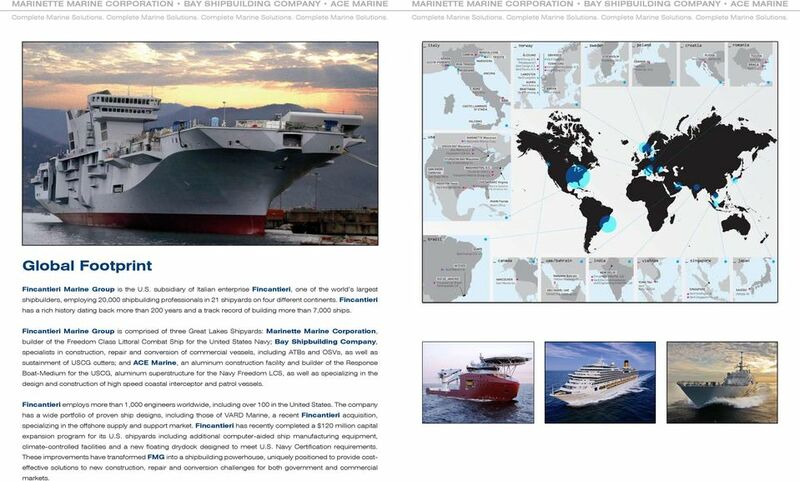 Global Footprint Fincantieri Marine Group is the U.S. subsidiary of Italian enterprise Fincantieri, one of the world s largest shipbuilders, employing 20,000 shipbuilding professionals in 21 shipyards on four different continents. 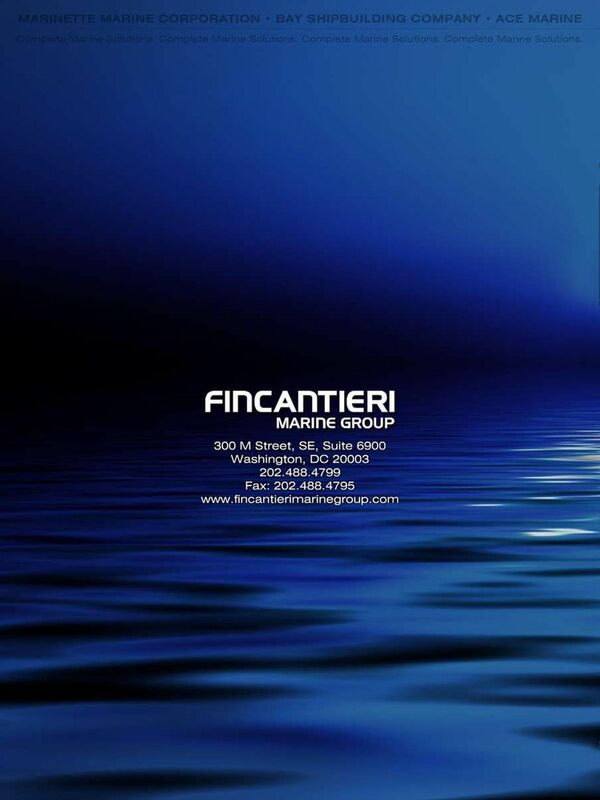 Fincantieri has a rich history dating back more than 200 years and a track record of building more than 7,000 ships. 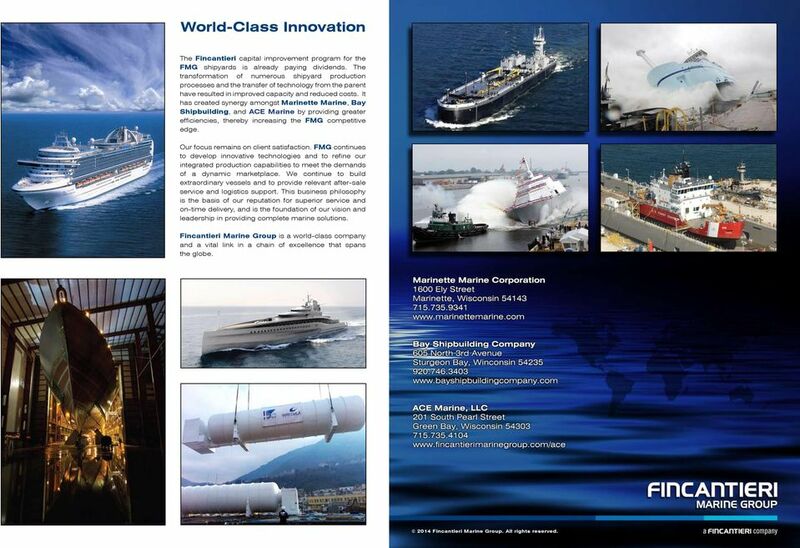 Fincantieri Marine Group is comprised of three Great Lakes Shipyards: Marinette Marine Corporation, builder of the Freedom Class Littoral Combat Ship for the United States Navy; Bay Shipbuilding Company, specialists in construction, repair and conversion of commercial vessels, including ATBs and OSVs, as well as sustainment of USCG cutters; and ACE Marine, an aluminum construction facility and builder of the Response Boat-Medium for the USCG, aluminum superstructure for the Navy Freedom LCS, as well as specializing in the design and construction of high speed coastal interceptor and patrol vessels. Fincantieri employs more than 1,000 engineers worldwide, including over 100 in the United States. The company has a wide portfolio of proven ship designs, including those of VARD Marine, a recent Fincantieri acquisition, specializing in the offshore supply and support market. Fincantieri has recently completed a $120 million capital expansion program for its U.S. shipyards including additional computer-aided ship manufacturing equipment, climate-controlled facilities and a new floating drydock designed to meet U.S. Navy Certification requirements. These improvements have transformed FMG into a shipbuilding powerhouse, uniquely positioned to provide costeffective solutions to new construction, repair and conversion challenges for both government and commercial markets. 4 Marinette Marine Corporation (MMC) was founded in 1942 along the Menominee River in Marinette, Wisconsin, to meet America s growing demand for naval construction. From humble beginnings with a contract to build five wooden barges, MMC has grown into a world-class shipbuilder, having designed and built more than 1,500 vessels. The shipyard specializes in government work and has expansive climatecontrolled facilities, including 550,000 square feet of manufacturing, warehouse and receiving space. MMC employs cutting-edge, computer-controlled manufacturing equipment and has heavy-lift capabilities to meet the most demanding requirements. MMC is internationally recognized for innovative and highly efficient modular, subassembly and assembly-line manufacturing techniques. This sophistication in construction methods has allowed MMC to build some of the most technologically advanced vessels in the world such as the U.S. Navy s Freedom-Class Littoral Combat Ship (LCS). 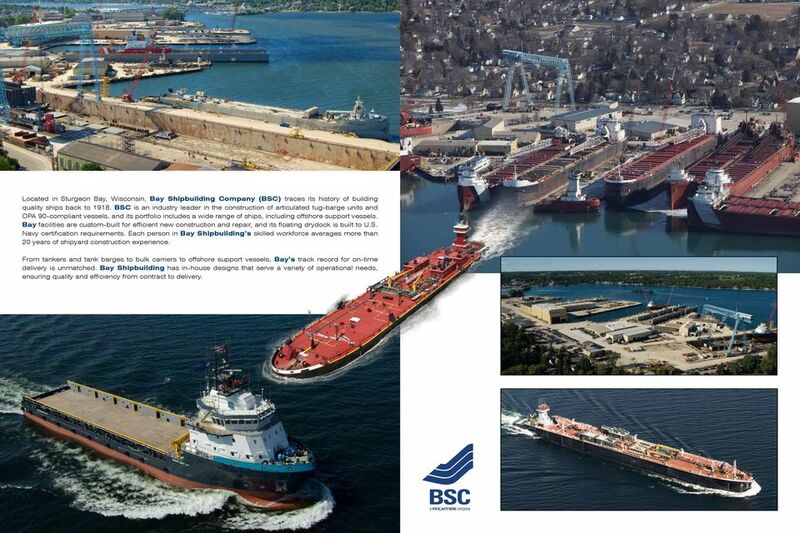 5 Located in Sturgeon Bay, Wisconsin, Bay Shipbuilding Company (BSC) traces its history of building quality ships back to BSC is an industry leader in the construction of articulated tug-barge units and OPA 90-compliant vessels, and its portfolio includes a wide range of ships, including offshore support vessels. Bay facilities are custom-built for efficient new construction and repair, and its floating drydock is built to U.S. Navy certification requirements. Each person in Bay Shipbuilding s skilled workforce averages more than 20 years of shipyard construction experience. From tankers and tank barges to bulk carriers to offshore support vessels, Bay s track record for on-time delivery is unmatched. Bay Shipbuilding has in-house designs that serve a variety of operational needs, ensuring quality and efficiency from contract to delivery. 6 ACE Marine, located in Green Bay, Wisconsin, is a state-of-the-art, climate-controlled aluminum construction facility. Purpose-designed for assembly-line manufacturing of aluminum vessels, the facility uses innovative modular construction techniques and component manufacturing. Efficiencies in production are achieved by allowing modules to be pre-outfitted to a very high degree while internal compartments are still very accessible. 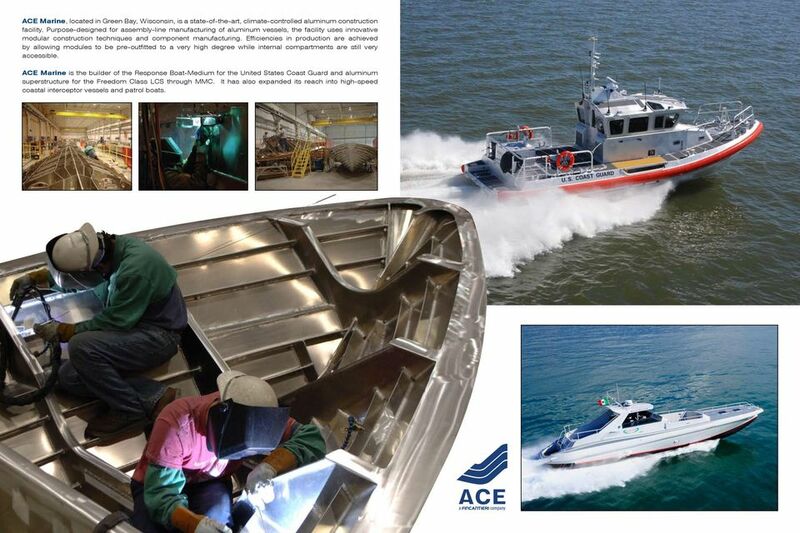 ACE Marine is the builder of the Response Boat-Medium for the United States Coast Guard and aluminum superstructure for the Freedom Class LCS through MMC. It has also expanded its reach into high-speed coastal interceptor vessels and patrol boats. 7 Safety is Job One. Shipbuilding safety starts with a management team with the experience to recognize the business imperative of establishing a safe manufacturing environment. It is reinforced by a corporate philosophy that fully accepts responsibility for the safety of its workforce. This concept accurately describes the safety attitudes and actions at the shipyards of Fincantieri Marine Group. Excellence by Design Having built more than 7,000 ships, Fincantieri offers a wealth of resources to the FMG companies with important significance to operators in key markets such as offshore exploration and production, polar operations, maritime security and military sealift in the littorals. 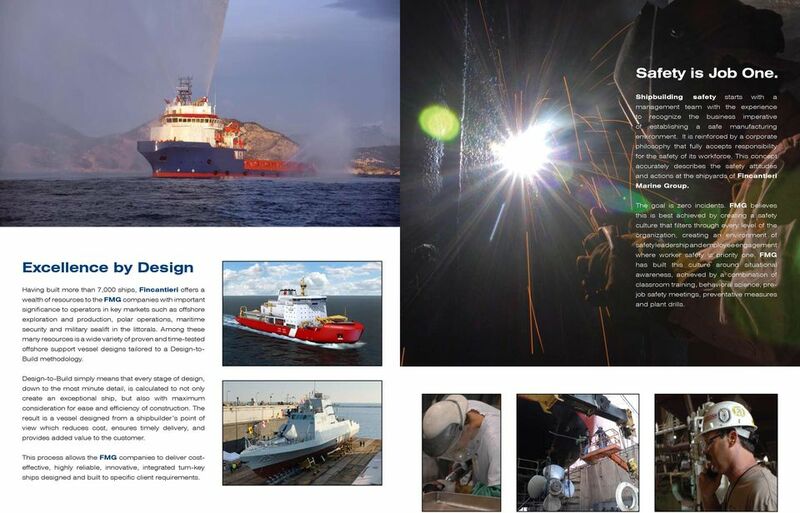 Among these many resources is a wide variety of proven and time-tested offshore support vessel designs tailored to a Design-to- Build methodology. The goal is zero incidents. FMG believes this is best achieved by creating a safety culture that filters through every level of the organization, creating an environment of safety leadership and employee engagement where worker safety is priority one. FMG has built this culture around situational awareness, achieved by a combination of classroom training, behavioral science, prejob safety meetings, preventative measures and plant drills. Design-to-Build simply means that every stage of design, down to the most minute detail, is calculated to not only create an exceptional ship, but also with maximum consideration for ease and efficiency of construction. The result is a vessel designed from a shipbuilder s point of view which reduces cost, ensures timely delivery, and provides added value to the customer. This process allows the FMG companies to deliver costeffective, highly reliable, innovative, integrated turn-key ships designed and built to specific client requirements. 8 World-Class Innovation The Fincantieri capital improvement program for the FMG shipyards is already paying dividends. The transformation of numerous shipyard production processes and the transfer of technology from the parent have resulted in improved capacity and reduced costs. It has created synergy amongst Marinette Marine, Bay Shipbuilding, and ACE Marine by providing greater efficiencies, thereby increasing the FMG competitive edge. Our focus remains on client satisfaction. FMG continues to develop innovative technologies and to refine our integrated production capabilities to meet the demands of a dynamic marketplace. We continue to build extraordinary vessels and to provide relevant after-sale service and logistics support. This business philosophy is the basis of our reputation for superior service and on-time delivery, and is the foundation of our vision and leadership in providing complete marine solutions. Fincantieri Marine Group is a world-class company and a vital link in a chain of excellence that spans the globe Fincantieri Marine Group. All rights reserved. Maritime High School Course Outline The required courses for College Preparatory High School Diplomas and General Diplomas are set by State Education Departments, and further defined by local school boards. One team one goal How Can Ship Owners And Ship Builders Work Together To Drive Innovation? P T. A N D I K A B U A N A L I N E S E S T A B L I S H E D S I N C E 1 9 9 3 w w w. a b l s h i p p i n g. c o m OFFSHORE SUPPORT SHIP AGENCY PROJECT LOGISTICS WHO WE ARE Over the past two decades, PT. We Connect. We are proud of what we re doing at AFL. Let us show you how we can make a difference. Special Ships HANJIN HEAVY INDUSTRIES & CONSTRUCTION CO., LTD. The Keltic Marine Group provides development, design, construction and management of specialized mission sensitive marine craft. 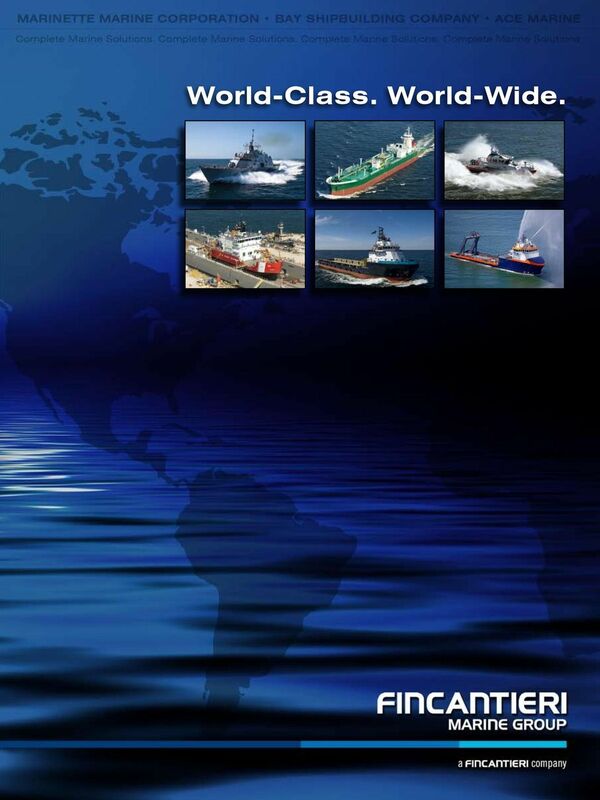 World-class specialist marine & offshore HVAC & Refrigeration services. Now available around the world. BRUCE P. DALCHER, ESQ. Bruce Dalcher is an attorney who recently formed the professional limited liability company of Bruce P. Dalcher, PLLC to begin a specialized law practice based in Washington, DC. About the Port. Created as an act of state legislation 1962. Five member cities. Coronado. San Diego. Coronado. National City. MARKISCHES WERK. Your Engine. Our Ingenuity.